You are at:Home»What Is A Blockchain? 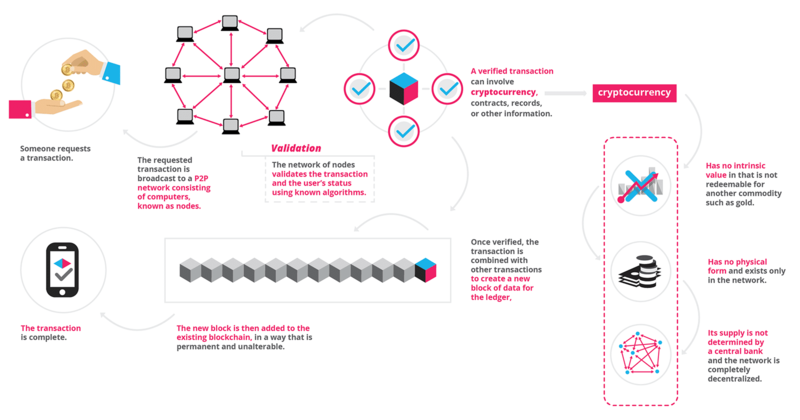 Lesson 5 – What Is A Blockchain? Within the sphere of crypto-dom, a Blockchain is a public incorruptible digital database or ledger of all cryptocurrency transactions. The blockchain can also be programmed to record not just financial transactions but virtually everything of value. Picture a spreadsheet that is duplicated thousands of times across a network of computers. Then imagine that this network is designed to regularly and simultaneously update this spreadsheet and you have a basic understanding of the Blockchain. The Blockchain database is not stored in a single location. That database is distributed on each computer that makes up the Blockchain. If it were stored at a central or single location, a hacker could corrupt it. That the exact same database is in the tens of thousands of computers on the Blockchain, it is not possible to hack them all. The Blockchain is intelligent and has checks and balances to ensure the database on each computer within the Blockchain is the same and incorruptible. Note: In order for a hacker to hack the Blockchain, he would have to hack into each and every computer that is on the Blockchain. That would require an enormous amount of computing power and resources. Thus, it would be impractical, time-consuming, and extremely costly. Attempts to hack the Blockchain by sophisticated hackers occur each and every day. The Blockchain is so intelligent that it has built up an immunity over time and will continue to do so. Bitcoin and the Blockchain have never been hacked. They cannot be. Cryptocurrency Exchanges have been hacked, but not Bitcoin or the Blockchain. The Blockchain is comprised of tens of thousands of computers (each making up what are called nodes) on a distributed computer network. What is distributed to these computers, cryptocurrency transactions! Each computer within the Blockchain stores a copy of each crypto transaction. Each computer;s database will be identical. Each node (computer) on the Blockchain “heartbeats” every ten seconds. In other words, each computer is updated constantly 24/7/365 every 10 seconds. It is the function of the Blockchain to receive, store, and process the cryptocurrency transaction. Processing involves verifying and confirming that the transaction is a legitimate one. Once the transaction is confirmed, it is sent to the person or entity for which it was intended. The confirmation process checks your transaction – which is contained within a “block” of code to see if you are the legitimate and exclusive owner of the cryptocurrency. A good analogy is that of a “Bouncer” at a nightclub, except you have to go through six bouncers before you are granted entry into the club. It is the Bouncers job to check that you have a valid (and not a forged) ID and that you have money to spend. The “block” of data is sent and stored on the Blockchain where it is processed and confirmed. It is important to understand that each cryptocurrency has it’s own Blockchain (computer network). Sometimes you will hear persons reference the Bitcoin “network.” Well, they are referring to the Bitcoin Blockchain. It is also important to know that one cannot conduct a “Bitcoin” transaction to another cryptocurrency Blockchain. You can only conduct Bitcoin transactions to the Bitcoin Blockchain. Attempts to conduct a Bitcoin transaction to an Ethereum Blockchain (From a Bitcoin wallet to an Ethereum wallet) will result in a loss of your money. An Ethereum Blockchain will not know what to with a “block” of data that is sent to it. The code is different. The Ethereum cannot store the transaction in its database because it does not belong there and so the block is deleted and so is your transaction. The reverse is also true. A Bitcoin block will not know what to do with an Ethereum block of data. It is worth knowing that the size of a block of data matters. Why? Because the larger the block of data (in Megabytes) the more transactions can be placed inside of it and sent to the Blockchain. The block “payload” for Bitcoin is set at 1 Megabytes (1MB). Sending Bitcoin transactions to the Bitcoin Blockchain (network) were fast and inexpensive in the early years of the currency. Now, that more people, organizations, and countries are on the Bitcoin bandwagon the Bitcoin “block” space is at a premium. The result is higher transaction fees on the cryptocurrency exchanges. On November 16, 2017, a fork will occur on with Bitcoin. A fork is a split or division of the Bitcoin currency and Bitcoin Blockchain resulting in two separate but similar currencies: The original (legacy) Bitcoin currency and the new one. In this fork, the new currency is called SegWit2x or Bitcoin2x. A fork can come about for many reasons. In the case of Bitcoin, it is believed by some that the size of the Bitcoin block needs to be increased so as to allow for more transactions to be placed inside of it and also to reduce transaction fees. But you have those who are loyal to the original Bitcoin currency who reason that any changes made to the currency goes against what the creator of the currency (an alias known as Satoshi Nakamoto) and any changes in the code would not make it Bitcoin anymore but something else. Since both sides cannot agree, a fork – or a new version of the Bitcoin currency – is created. Those loyal to the original Bitcoin currency are happy because the Bitcoin code is maintained intact. Those on the other side who see the need for a change in the code are happy because they are getting what they want. Ultimately, is you and I – the user – who will determine which currency will be the most popular and used. Will Bitcoin continue to be king and dominate the cryptocurrency market? Or, will it be demoted? We shall see come November 16, 2017. Note: The November 16, 2017, fork was canceled. Listen to Caitlin Long of Symbiont as she explains why Bitcoin and the Blockchain will stomp out Wall Street fraud.